ArcticCross #1 at the Kincaid Park Lower Stadium. Cost: Adults: $20/race or $100 for series. Juniors (<18): free. Beginner Men at 10:30 am for 40 min. All Women (Beginner, Master, Open) at 11:30 for 40 min. Kiddo Kross (pedallers and striders) at 12:30 for one lap. Open Men & Masters Men at 1:00 for 50 min. Courses: Cyclocross courses are 1.5 to 2 mile circuits. They incorporate pavement, grass, mud, run-ups, and barriers. 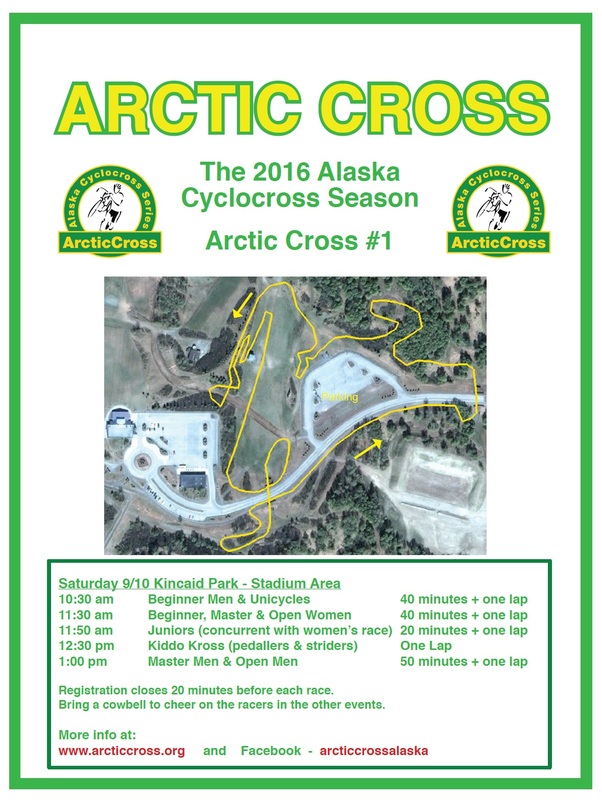 Cylcocross is the ideal cross-training sport for the transition season. Series: Best 5 of 7 races count toward points total.